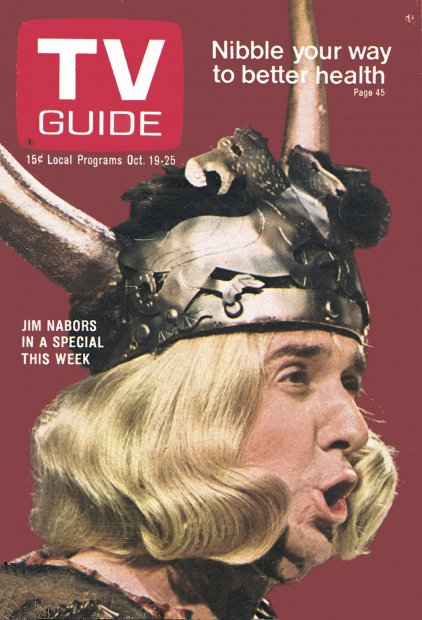 That blonde-haired Adondis on the cover is Jim Nabors. More about him later. My first thought in leafing through this issue was that there were a lot of specials being shown. Sunday CBS started it off with a comedy special featuring "Presidential candidate" Pat Paulson. Monday night ABC has a documentary on "Hemingway's Spain" (complete with the running of the bulls), and on Wedneday CBS had the first of four "National Geographic" specials, this one on America's National Parks. It had to compete with ABC's profile of Sophia Loren (who had a few natural wonders of her own) and a Babar the Elephant cartoon, and NBC's Kraft Music Hall with the Friar's Club roast of Johnny Carson, followed by a Bing Crosby special, with guests Bob Hope, Diana Ross and the Supremes, Jose Feliciano, and Stella Stevens. Thursday featured the third showing of It's the Great Pumpkin, Charlie Brown on CBS, and through the entire week ABC had the Olympics. The NET station, Channel 2, has a program on Tuesday nights called Books and Ideas, which this week features my old professor and adviser from Hamline University, Dr. Scott Johnston (chair of the Political Science department), providing historical perspective on the presidential campaign. *I was going to make a joke here about how it was appropriate for the Democrats to be on a show with the word "Red" in it. You know - Reds, Commies. But most people wouldn't get it. The color red is now associated with the Republicans. The ideological red, on the other hand, still ties in to the Dems. I mentioned that the Summer Olympics are in full swing, and ABC has complete coverage. A couple of obvious points to note: first the timing. 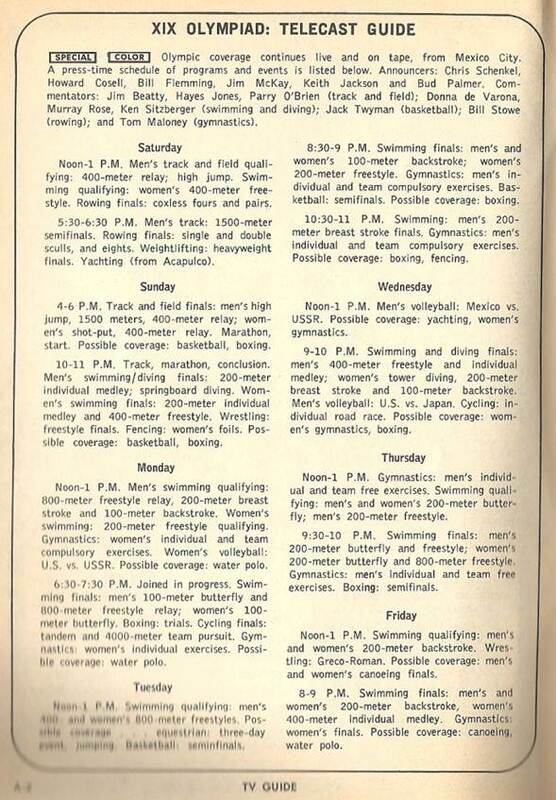 The opening date of October 12 (due, I assume, to the summer heat in Mexico City) made these Olympics the second-latest to be held, behind only the 1956 Melbourne Summer Olympics, which began in November. I find it hard to think the American TV networks would encourage this nowadays, since an October date would conflict with both the MLB playoffs and the NFL. Total for the week: 14 hours, 30 minutes. I particularly like the one hour coverage that ABC offers from noon to 1pm (CT) - after all, it would have been the housewives watching TV back then, and many of them were probably miffed that their stories had been pre-empted. I think, although I'm not sure, that NBC offered more coverage in one day of this year's Olympics than ABC did that entire week (not to mention the secondary networks on which NBC also had the Olympics). Is more better? Well, I'm not at all sure. Watching the Olympics as I did back in the day, I always had the feeling I saw everything I needed to see. 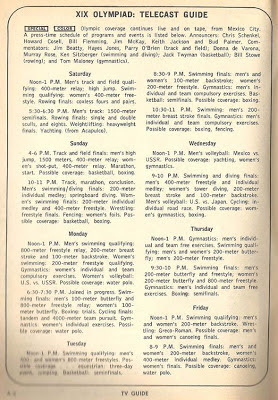 I wanted to see who won the gold medal in the 100 meters - I didn't care about the preliminary heats. I didn't care about gymnastics at all, but if I had I would have been satisfied with the final round. In other words, I didn't need to see every single thing that happened at the games. And while ABC pioneered the "Up Close and Personal" concept (which NBC has taken to a nausiating level), I don't imagine there was room for two much of it in a one hour timeslot. Personally, I think two to three hours of coverage per night, with expanded coverage on the weekends, is more than enough. And that brings up a related note: the amount of sports coverage on TV period. In addition to the Olympics, let's see what other sporting events were on that weekend. On Saturday, ABC had college football (Northwestern vs. Ohio State) and Wide World of Sports (auto crash championships, national air races). CBS had Championship Bowling (not to be confused with ABC's Pro Bowlers Tour, which didn't start until January). NBC, with the World Series complete, turned the time to their affiliates. On Sunday, NBC had an AFL doubleheader: Buffalo vs. Boston at 12:30, followed by Oakland at Kansas City at 3:00 (two pretty good matchups). CBS's NFL game was Cleveland vs. Baltimore at 1:00. The independent station, Channel 11, had Notre Dame highlights (vs. Illinois) at noon. Oh yeah, there was a hockey game on later in the week - North Stars vs. Flyers on Thursday. I consider myself as much of a sports fan as the average guy, and I suspect I watched almost everything that was on that week. * But it's kind of refreshing to see that the networks didn't try and shoehorn sports into every single hour of the weekend. Looking at a typical weekend schedule today, there's a lot of stuff that seems to be on simply for the sake of having something on. Extreme sports. Beach volleyball. Bike racing. Maybe that kind of thing turns you on, but in the immortal words of Captain Kirk, "too much of anything, even love, isn't necessarily a good thing." As with the Olympics, sometimes less is more. *I used to bring my small TV out of the bedroom and put it on top of our console TV in the living room, so I could see both the NFL and AFL games at the same time. My family was very patient. Ed Sullivan: The 5th Dimension, singers Tony Sandler and Ralph Young, a filmed interview with Steve McQueen, and comics Joan Rivers and David Frye. Hollywood Palace: Diahann Carroll welcomes actor-singer Richard Harris, satirist Mort Sahl (on Presidential candidates), singer-composer Jim Webb, and her "Julia" co-stars Marc Copage and Michael Link. Also spotlighted: Palace choreographer Buddy Schwab. Well, I don't think either show is fielding its best lineup this week. Ed's interview with McQueen (I would guess promoting either Bullett or The Thomas Crown Affair) is probably the highlight of the show. David Frye was an impressionist, and he's probably doing political schtick, at which he could be pretty good. On the other hand, the Palace (which KMSP unaccountably ran on Sunday afternoon, putting a movie into the Palace's regular Saturday-night slot) doesn't have much to recommend it. I never liked Julia and I wasn't a particular fan of Diahann Carroll either, so neither she nor her co-stars do anything for me. 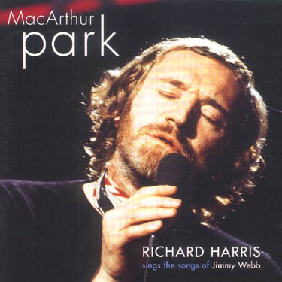 The most curious aspect of this show is the apperance of Richard Harris and Jimmy Webb. Harris, who was far better known as an actor than singer, nonetheless had an enormous hit with Webb's composition "MacArthur Park," and yet the TV Guide listing makes no mention of it being done on the show. In fact, though both Harris and Webb are identified as singers, neither of them are listed as performing anything, while everyone else's performances are dutifully noted. I wonder if this was is a mistake, that the listing somehow was abbreviated and "MacArthur Park" was left out. * On the other hand, it does run for seven minutes, and that's a long time for TV - but then I've seen some pretty painful comedy skits run that long. So who knows? *But not "left out in the rain." You have to know the lyrics to get it. And now the Jim Nabors special. In 1968 Nabors was stilll the star of Gomer Pyle, U.S.M.C., although that would soon be a distant memory. Nabors had already become famous as Carol Burnett's season-opening good luck charm, and the next season he would check out of the Marines and begin his own variety show. For now, Nabors was making is first tentative steps in that direction by hosting an hour-long special on Thursday night. His guests were Carol Burnett (naturally), Debbie Reynolds, Vicki Carr and Mary Costa. That picture on the cover is from a sketch in which "Operatic arias by Rossini, Strauss and Wagner provide the music vehicle as Jim, Carol, Vicki and Mary satirize excessively dramatic TV commercials." My guess is that Jim is performing the aria "Valkyrie of the Dolls." Back to that Hollywood Palace thing for a minute. I've been trowling the Google News Archives, and came across the TV listings from the Sumter (SC) Daily Item for October 19, 1968. Their "Best Bet" for that night is, interestingly enough, the Palace, so they provide a pretty extensive preview of the show. And in fact we find out that "the suave actor-singer Richard Harris" does sing - a song called "The Yard Went on Forever. 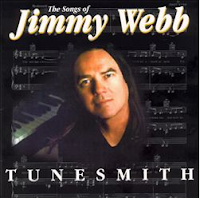 "* And "composer Jim Webb" is on hard with "some of his originals." *Not to be confused with "MacArthur Park," even though many people thought it went on forever. This gets curiouser and curiouser. Sure, Webb could have sung one of his own compositions* - someone had to. But seeing as how Harris had such a hit with MacArthur Park, I can't believe that he wouldn't have been the one to sing it. What are the odds that the singer and the composer of one of the year's biggest hits (#2 on the Billboard charts) would appear on the same show, and yet neither one of them would perform it? I continue to be skeptical. *Which were numerous. He wrote "By the Time I Get to Phoenix," "Wichita Lineman" and "Galveston," which were big hits for Glen Campbell, and "Up, Up and Away," which was a big hit for The 5th Dimension. I wonder if they sang it on Sullivan's show that night? He also wrote "The Yard Went on Forever," so maybe that's the Harris/Webb link. Incidentally, the producer of The 5th Dimension's album was Johnny Rivers. I didn't know he was a record producer as well as a singer. He had a pretty big hit himself - "Secret Agent Man," the theme (in the U.S.) for Patrick McGoohan's series Secret Agent. But as far as I know, McGoohan never recorded a song by Jimmy Webb, nor appeared on The Hollywood Palace. Or Ed Sullivan, for that matter. But Secret Agent did run on CBS, the same network that aired Glen Campbell's series, if that counts for anything. The Hollywood TV Teletype often reports on projected series, possible pilots, and other projects that never come to fruition. Here are three that did. 20th Century Fox is working on a "black drama" starring Lloyd Haynes and Denise Nicholas called Two Twenty Two, which you probably know as Room 222. While it was in fact a fully integrated show, its two Emmy winners were white: Michael Constantine and Karen Valentine. Fox also has a project called Nanny, "featuring an English nursemaid." The show went through another name change to Nanny Will Do, before winding up, of course, as Nanny and the Professor, with Juliet Mills as the nanny every kid wanted. Finally, MGM has a project for a medical series, called U.M.C., which stands for "University Medical Center." Drop the "University" and you wind up with Chad Everett's big hit, Medical Center. So we never did answer the question about "MacArthur Park." But, rather than leave you completely hanging (as the audience on Palace apparently was), you deserve to see Richard Harris singing his biggest hit. But since there doesn't seem to be any live footage of Harris from that era, I'm afraid you're going to have to make due with this "version" from SCTV. Was the hockey game in Minnesota or Philadelphia?? I would think it would be the latter, unless it was the Northstars' season or some opener, in which the team might have allowed it to be locally telecast. I meant to write "Was (it) the Northstars' season or home opener.."
You're right - it was in Philly. As I recall, back then the Stars only televised 25 games for the whole year: three home, the rest road. BTW, final score in this game was 3-3. While I can’t tell you if "MacArthur Park" was sung on that edition of the "Hollywood Palace", I think I have a good reason why "The Yard Went on Forever" was. It was the follow-up single to "MacArthur Park" which should have been available at that time. Unfortunately, "Joel Whitburn’s Billboard Book of Top 40 Hits" does not show it charting. With the help of YouTube, I was able to refresh my memory of this all but forgotten song. Both the "Yard" and "Park" run longer than the average Top 40 song of the day, 5½ and 7½ minutes, respectively. Both have similar epic orchestrations and music bridges. However, "Yard’s" lyrics “take the cake” (yeah, I know), for including a prayer sung in Latin. Having discovered your TV blog from your posts on www.radiodiscussions.com, I look forward to each new entry. Thank you. Rick, you win the Bad Pun of the Day Award! :) Thanks for the additional info. Glad you enjoy the posts - they're a real kick for me as well! I believe Nabors had a variety special in the 1966-67 season, sponsored by American Motors.